As I mentioned in part 1, you can do lot of things to ruin "Burn Amarr" for the evil Goons. Now I outline the most effective strategy against them. In last year Burn Jita they failed surprising amount of times to kill the target freighter on the first run. It's partially because it's impossible to know the EHP of the freighters as they are heavily reliant on skillpoints, partially because of lag and messups. But the real reason is that freighters and especially JFs have lot of EHP and in a 0.9 system you have little damage due to the short time before Concord arrives. It's hard to get large enough fleets, so the FC can wait more, making everyone bored or undock whatever he has and hope for the best. The latter often leads to freighters surviving in low hull. These cases the bumpers keep it tackled and after GCC is up, they finish it. However it takes about 20 minutes (not counting TiDi) for a gank fleet consisting a ragtag crew to strike again. 15 mins GCC and 5 more before everyone is back at the keyboard and got a new ship. During that time you can repair the freighter, undoing the damage done last run. If reppers are doing well, Goons must kill the ship in one run or they did nothing. This slows down ganks extremely, since they must be absolutely sure that they have an overkilling fleet before undocking or they just provided fun to their enemies. The simple way of doing it is any random repping ship. Even a logi frigate helps. If you want to participate fighting the Evil during Burn Amarr, you can get into a T1 logi cruiser in a few hours and make difference. I purposefully not post fitting, anything that is bonused for repping shield or armor is a great addition. You have time to learn repair drone operation 5, that's not a long skill and an overall useful one. Don't forget to name your ship "AFK ratter" and do what a true Goon would: set a large orbit around the freighter, send drones, go AFK for 20 mins. 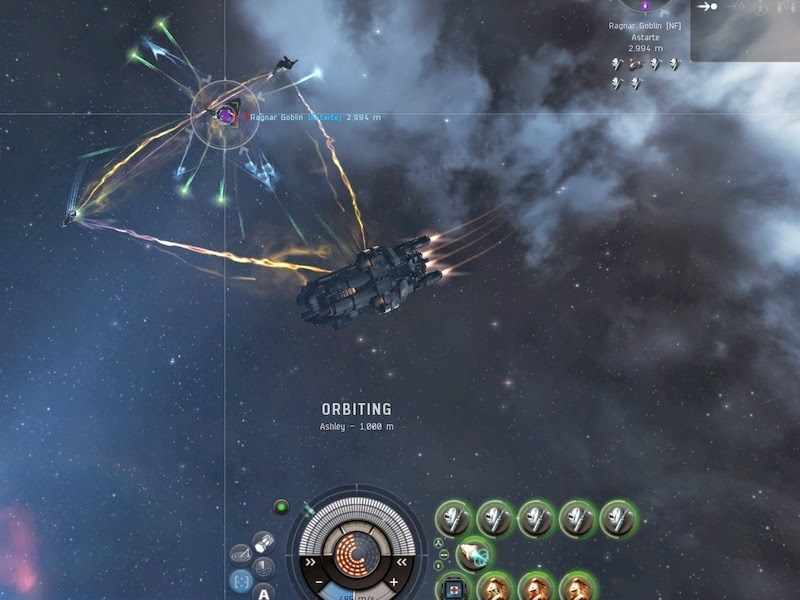 If you are the only player in EVE who can't fly an Isthar in 2015, use a Domi. If you have multiple pilots, trained in logistics skills, you can go wild. Use a hull repping battleship, captrading with a logistics ship. With a 100mn MWD the battleship will be fast enough to arrive fast to the freighter and stay close when bumped. The logi needs to keep orbit the battleship due to short cap transfer range. It's probably better to use a T1 logi to avoid losing a T2 to gankers. Depending on skills, you can run 2-3 large remote hull reppers while cap stable, being much more powerful than an AFK Istar. Of course you should have hull maintenace drones on both ships and also armor/shield repper on the leftover fitting of the logi. Below you can see what I will bring: A 5x T2 large repper (+4x T2 large drone) Typhoon, a Basilisk, a Guardian and an offgrid booster Astarte (acting as freighter on the picture). The logies captrade with each other and provide armor and shield reps to the freighter and enough cap to run the battleship. Come! Let's give the minions of Evil a "Burn Amarr" worth remembering! Yes it is cap stable. It's also repping at awesome rate. Also it dies to 3 catalysts.